Almost all of my CouchDB instances lately have been run inside of Docker containers. As a Windows user, installing and using CouchDB through Docker has been such a massive improvement over the janky "old" way that I cringe just thinking about installing a permanent, non-containerized instance on my machines or servers. Typically my dev setup for any project over the past year or so has been to set up a Docker compose file that starts both the developed app in one container, and a database in another container, and then networks them together. 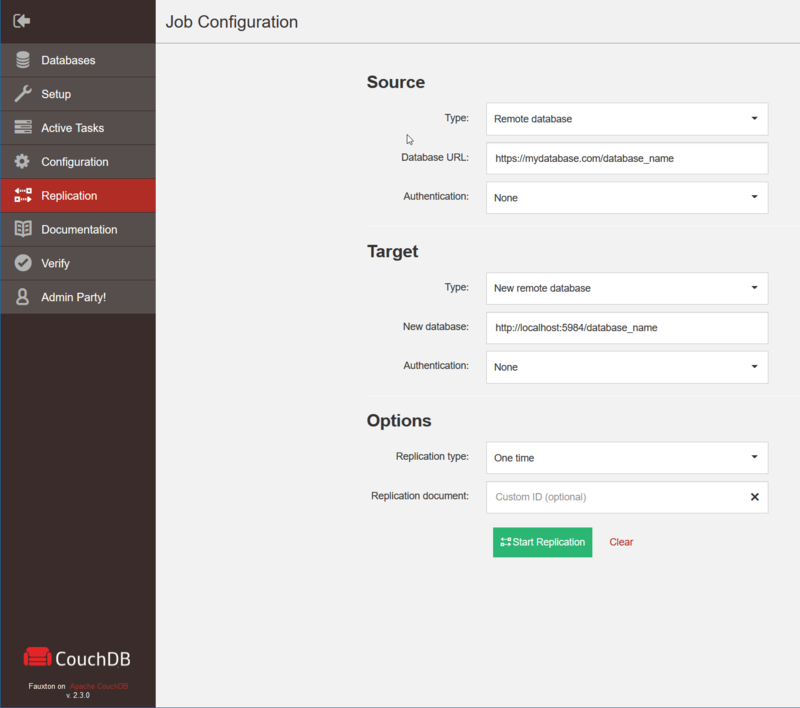 Sometimes its a SQL database, sometimes it's PostgreSQL, and sometimes it's CouchDB. Whatever the reason for your sudden absence of data, you might need to reseed your database with data that you know is valid. 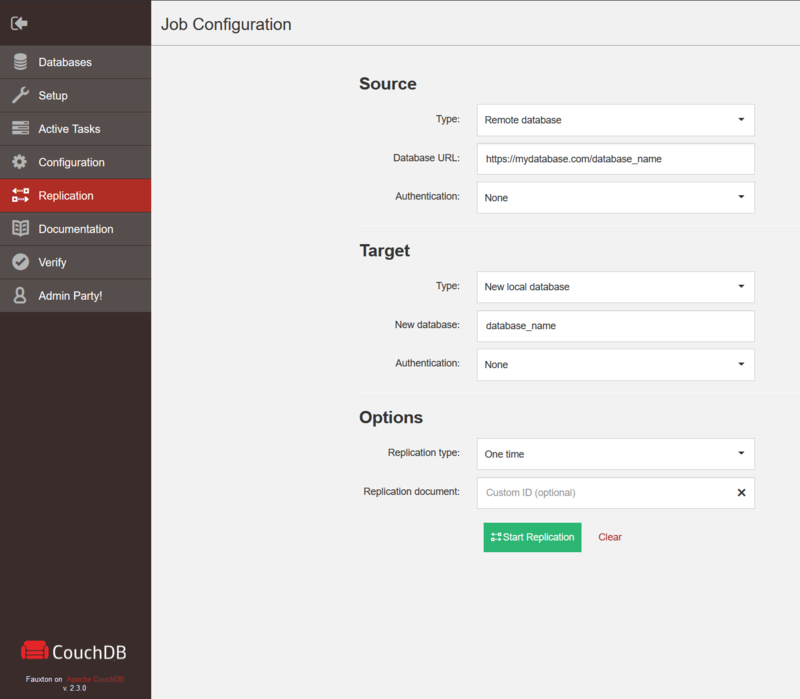 CouchDB's replication system is perfect for this -- just log in to the built-in Futon management database (at localhost:5984 by default) and start a new replication job from an existing remote database to your local database. After starting a replication job you'd usually be good to go with a freshly seeded database, but after I started containerizing my CouchDB my replications suddenly started failing. They'd immediatley error out and start retrying, with no obvious error message until the replication job eventually failed completely. It turns out that, for some reason I haven't been able to figure out, the containerized CouchDB instance thinks its own address is http://any:5984. When you try to or from the containerized CouchDB instance, Futon will think the local instance's address is http://any:5984/database_name -- an obviously bizarre and invalid address that the container will subsequently fail to connect to. Maybe I missed a configuration step somewhere, I'm honestly not sure, but thankfully this is really easy to fix. All you need to do is change the local target to a remote target, but use http://localhost:5984/database_name as the address. Voila, replication works once again! Â© Nozzlegear Software, 2019. All rights reserved.